The first thing to know is that it's pronounced 'Oh-Hee-Ya' in the Dakota language... Ohiya means win! With our delicious food and buffets, big jackpots, entertainment, events and bingo, we are the place to be, and the place to WIN! Welcome to Ohiya Casino & Resort, located just a few minutes east of Niobrara on scenic Highway 12 in north east Nebraska. Owned and operated by the Santee Sioux Nation, the casino is currently celebrating 17 years in the gaming industry, and has the distinction of being Nebraska's first casino! On February 15th, 2013, we opened the doors to our brand new, state-of-the-art casino, featuring over 400 exciting machines, expanded event and entertainment facilities, great dining facilities, lounge and comfortable hotel. When you visit our new casino, begin by exploring our exciting casino floor featuring the newest games and machines. Treat yourself to Ohiya Casino & Resort’s extensive buffet, delicious entrees, and food at Legends Restaurant. Ohiya Casino & Resort is also the ultimate destination for relaxing and rejuvenating. Our clean, comfortable, and spacious rooms will ensure you have the BEST getaway. Continue the excitement by attending exciting events and entertainment including legendary musical artists, comedians and an exceptional variety of live entertainment. Ready to win? Then visit today and let our welcoming staff and thrilling amenities make your day. 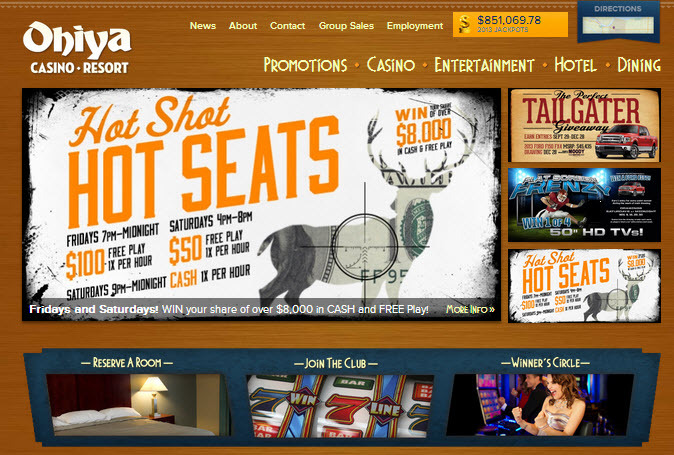 Visit our site often, and subscribe to our newsletter to check out the latest events, upcoming entertainment and the biggest promotions offered every day at Ohiya Casino & Resort! Copyright (c) 2015 - 2017 Santee Sioux Nation. All rights reserved.